A Thought Shared ....: Self explanatory.. It wasn't my intention to write anything for this, but having looked at it a few times, I have decided to add a few thoughts to it. 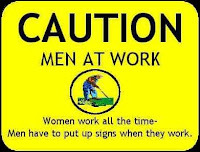 Men do indeed place signs advising caution when working. We like to give our fellow man a good chance of survival. Not so our female counterparts, however. They move family room furniture around without telling us, polish tiled floors and then place loose mats over them, and decant cleaning materials into wrongly marked containers, and not a word said, not one hint of a warning. So we enter the home carrying our document case, 'coffee to go' from the gas station and small bunch of flowers with which to greet our nearest and dearest, only to to discover that the mat in the hallway has taken on some of the properties of a 'magic' carpet. Having involuntarily deposited our coffee over the floor and broken half of the flowers, we walk into the family room for some sympathy, only to bump into the couch which has moved from one side of the room to 'just as you come in through the door'. Still no sign of 'nearest and dearest', we make our way into the kitchen, carefully checking for 'magic' mats, with intent to get something to clear up the coffee. Now, any reasonable person would expect the bottle marked 'floor cleaner' to contain floor cleaner, but no. It now has the same compound in it used to give loose mats their magic properties, so rather than clean, we just spread the mess. Men like signs. They remind us of what we are supposed to be doing and where. It is not a 'pride' issue, so much as a desire not to fall into the hole that we dug not five minutes ago. We see them as personal life preservers. We need them.